Rams has its Madison premiere at 6 p.m. Friday and 3 p.m. Sunday at the Union South Marquee Theatre, 1208 W. Dayton St. FREE! R, 1:30, three stars out of four. 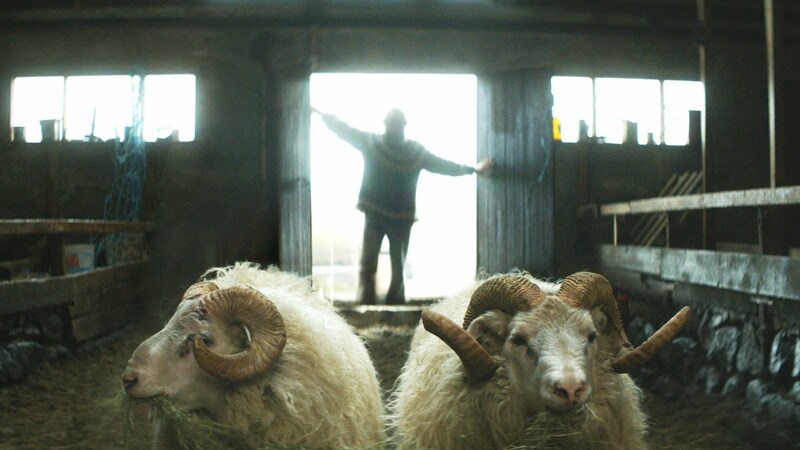 Grimur Hakonarson’s Rams was a movie I wanted to pet while I was watching it. Everything in the movie looks soft — the wool of the sheep that fill the remote Icelandic valley where the movie takes place, the long unkempt beards of the sheep farmers, even the sweaters. I wanted to gentle stroke all of it. But all that padding is a bit misleading. Because once it gets taken away, Rams is a film about hard, intractable forces butting heads with each other, over and over. At first, all seems well in the sleepy vally, where farmers tend sheep that are the descendants of generations of good stock. Brothers Gummi (Sigorour Sigurjónsson) and Kiddi (Theodór Júlíusson) tend to their own separate farms, about a hundred yards from each other. We learn that Kiddi’s farm was the original family farm, but the brothers had a falling out, and Gummi moved a little ways away. They haven’t spoken for 40 years, but out this far from civilization, you don’t get the sense that folks speak much anyway. At least, not to other people. To the sheep they are affectionate and doting, and we see Gummi tenderly caring for his flock, even giving one ram a bath (in the bathroom) when he needs a little TLC. The fact that the look and texture of these men and sheep are so similar suggests a deep bond. When Gummi tends to the sheep, he is tending to the land, to tradition, to his legacy. The first sign of discord comes at a local competition, where Kiddi’s ram just edges out Gummi’s for the top prize. Afterwards, Gummi examines the prize winner and discovers that the animal has “scrapie,” a fatal and highly contagious disease. Vets and health inspectors descend on the valley, and determine that all the sheep — in Kiddi’s flock, in Gummi’s flock, in the entire valley — will have to be killed. Hakonarson is fond of what one might call the “Searchers” shot — a man standing in a doorway, shot from inside, so that we can see the vast landscape behind him. Few films use simple absence as effectively as Rams does — we’ve unconsciously gotten so used to the little white dots on the hillside, the bleats on the soundtrack that their disappearance creates an uneasiness in our minds. This tension is amplified when the brothers start bickering, Kiddi insisting that Gummi has gotten revenge for losing the competition, destroying the valley for years in the process. Angry words are exchanged, a bullet is fired through a window, and things build towards a conclusion that’s like something out of a Norse legend. The real rams, of course, are the brothers, smacking their heads together until, too exhausted to continue, they consider the possibility of reconcilation. Rams is a very strange film, but it’s one that takes us to the top of the world to find people that, sure enough, we recognize as ourselves. Great review. In mine I said: The story itself is not the point of RAMS. Rather it is a lyrical and immersive insight into life on an Icelandic farm told through sensitive cinematography and understated storytelling”. Its a little gem of a film.